Increase your revenue in 3 easy steps. Explore your available options today. 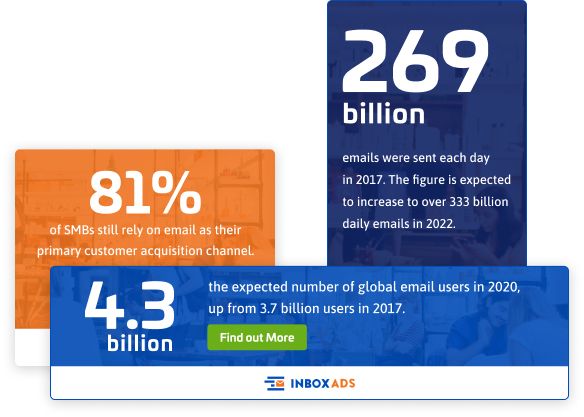 inboxAds helps deliver relevant and targeted ads with personalized content that readers WANT to see, while transforming the email into a revenue-driving machine. With $0 serving fees, it's pure profit for the newsletter publishers, with the added value or highly engaged audience. inbox Ads leads the email monetization industry with direct and programmatic demand. For our direct demand channels, we have been helping reputable brand acquire new consumers via email since 2011. Programmatically, we are connected to the most premium native and display DSP's (Demand Side Platforms) in the industry. Get The Most Out of Your Emails Now! inboxAds helps publishers deliver relevant and targeted ads with personalized content that readers WANT to see.